This session will explore the relationship between Lean Six Sigma and Leadership and discuss the critical role that Leadership and Organizational Culture play in the successful deployment of Lean Six Sigma Leadership. While Lean & Six Sigma tools are critical, there is a need to go beyond the tools and explore the relationship between leadership and successful outcome of Lean Six Sigma deployments. Lean Six Sigma involves people at all levels, and therefore culture must play an integral role in the success or lack thereof in its implementation in any organization as well as successful outcome of any Lean Six Sigma project. Very little focus is given to organizational culture or the impact of Lean Six Sigma on the organizational culture and leadership style. 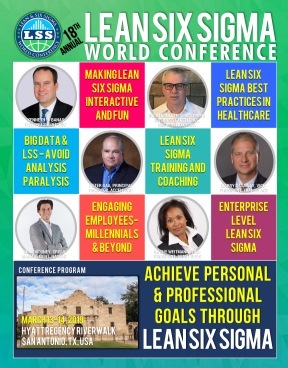 The session will explore the relationship between Lean Six Sigma and leadership and discuss the impact one has over other concerning achieving successful outcomes. The speaker will share the results of his research and discuss how Lean Six Sigma deployment results in the emergence of new leadership styles and also impacts the organization culture. The leadership and organizational culture play the role of mediator in this chain and improve the probability of successful outcomes of Lean Six Sigma efforts.